In response to an article I wrote, Ernie Zelinski wrote the following comment. Since great comments sometimes go unnoticed, I decided to feature Ernie’s comments in this blog post . . . 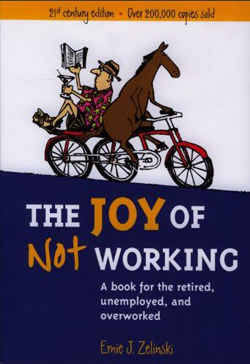 I have never used the term Amazon Bestseller or Amazon Best-Selling Author even though my How to Retire Happy, Wild, and Free is often #1 in Amazon’s retirement planning category and has sold over 10,000 copies on Amazon in 2013 alone. Plain and simple a best-selling author is one who has written a best-selling book. In Canada, a book is deemed a bestseller if it has sold 5,000 copies. So, the Canadian Best-Selling Author term should not be used unless a Canadian author has a book that has sold over 5,000 copies. In the U.S., which has a population 10 times what Canada has, I would say that a best-selling book has to have sold over 50,000 copies. But, according to book expert Dan Poynter, a true best-seller is one that has sold at least 40,000 copies. I can accept that. Sadly, there are thousands of authors (and people claiming to be book experts) out there who say that they are a Best-Selling Author. In my opinion, these people are frauds. For instance, I recently came across a writer from my hometown who claimed the status of a best-selling author because of his book on leadership being an Amazon bestseller. Yet I know that his book has sold a mere total of 25 copies in normal book channels in the U.S. since his book was released in August 2011. The 25 copies sold include those sold on Amazon. (I have a subscription to the U.S. reporting agency that gives the weekly and yearly sales of print editions in normal U.S. book channels including Amazon and the box stores.) So if this guy is a bestselling author, then 99% of people who have books on Amazon are bestselling authors. If he’s a bestselling author, then 99% of people who have books on Amazon are bestselling authors. Isn’t it about time that publishers and authors started showing some integrity by being impeccable with their word instead of using trickery and deceit to build themselves up? For the record, I have three books that have each sold over 100,000 copies in their print editions. That is the threshold I personally use for what makes a true best-selling book. I have two other books, one that has sold over 80,000 copies and another that has sold just over 50,000 copies which I still don’t consider true bestsellers, even though Dan Poynter would say that they are. By using a much higher threshold, I am more motivated and inspired to sell a lot more copies of my books and attain much more success. That is one of the many reasons why I have sold more books (800,000 copies worldwide) than 99% of authors ever will.